Focolare flows from "charism of unity" says Pope and calls on movement to "go out in spirit of dialogue". Five hundred members of the General Assembly of the Focolare movement were received in audience yesterday morning in Rome by Pope Francis. The assembly had been meeting since 1 September to elect its President, Co-President and General Council. The elections take place every six years. In 2008, Maria Voce became the first President to succeed Chiara Lubich after the founder’s death. Under the statutes of Focolare the President is always a woman flanked by a priest Co-President. 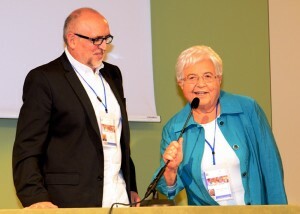 At the assembly held in Castelgandolfo south of Rome, Maria Voce was re-elected President, and a Focolare priest, Jesús Morán became Co-President. Fr Morán comes from Spain, but has lived at the service of Focolare for more than 25 years in Chile, Bolivia, Mexico and Cuba. A Philosophy and Theology graduate, he is a member of the Abba School, an interdisciplinary study centre of the movement. He has studied English in Ireland. Among the General Councillors elected, was Belfast woman, Juanita Majury. Ms Majury and David Hickey, who are co-directors of Focolare in Ireland, were the Irish representatives at the General Assembly. Addressing the Focolare assembly yesterday, Pope Francis said that half a century on from the Second Vatican Council, the movement was called, with the whole Church, to follow a new path of evangelisation, witnessing God’s love to all and in particular to the poor and most marginalised. The movement was born from a tiny seed in the Church and has grown into a tree whose branches spread through all kinds of Christian families and through all different religions as well, said Pope Francis. It flowed from a particular gift of the Holy Spirit – the charism of unity. The Focolare founder, Chiara Lubich, he said, was an extraordinary witness to that gift which she spread to so many different parts of the world. Secondly, “go out in a spirit of dialogue, giving freely of yourselves just as Jesus gave his life for us on the Cross”. Finally, the Pope stressed the importance of forming young people, so that “they too can serve the needs, concerns and hopes of men and women in the world today”. Earlier this week, during a break in the General Assembly, Maria Voce and Jesús Morán answered questions from journalists relating to the movement. Stressing the importance of developing the dialogues in which the movement is involved, Fr Morán said the presence of Muslims at the Assembly was a miracle.